Despite calls from Color of Change, the Center for Media and Democracy and other public interest groups to cut ties with the American Legislative Exchange Council (ALEC), State Farm Insurance, the nation's largest auto insurer and a major insurer of homes, has maintained both membership and leadership in the organization. Why would a Fortune #37 company that specializes in making a profit off of risk algorithms take the risk of alienating many of its own customers? "(O)ur work with ALEC is limited to research projects for use by public officials considering matters that impact the affordability and accessibility of insurance," a State Farm vice president wrote to Wisconsin insurance holder Samuel Hokin in response to concerns raised about ALEC last year. "Even when we disagree, we engage," wrote corporate VP Louise Perrin. In recent weeks, as the controversy over ALEC's agenda has increased, some have asked, "State Farm is Where?," taking a page from the ad campaign with the slogan, "State Farm is There." Citizens have also questioned whether State Farm is really "Like a Good Neighbor" when its funding for ALEC's operations has helped underwrite ALEC's support for the expansion of gun laws. Since 2005, ALEC has advanced as a model the law in Florida known as the "Castle Doctrine" or "Stand Your Ground," "Shoot First" or even "Kill at Will." That law had been cited as the basis for several weeks for not arresting George Zimmerman, who shot and killed his new neighbor, the unarmed Florida high school student Trayvon Martin. The Wisconsin policy holder had written State Farm that by supporting ALEC, it was supporting an "anti-democratic organization that is bent on destroying the way of life that State Farm members... hold dear." What does State Farm get out of ALEC membership and what does ALEC get out of State Farm? State Farm General Counsel Roland Spies serves on the ALEC Private Enterprise Board, which sits jointly with its Public Sector Board at ALEC's annual board meeting. Emory Wilkerson, another corporate counsel, served in 2011 on the ALEC task force where corporate lobbyists vote as equals with elected officials on "model" insurance-related bills. State Farm has also been a chairman-level sponsor of ALEC's annual conference, which typically means a hefty payment to the organization ($50,000 in 2010), beyond other pay to play donations by the corporation to ALEC for a seat on its "Commerce, Insurance and Economic Development Task Force," for example. State Farm's participation on ALEC's insurance committee has put the insurer in a position to benefit from several major pieces of insurance industry model legislation. The most prominent of these, in the auto insurance industry, may be the Consumer Choice Motor Vehicle Insurance Act. Among other things, the "Consumer Choice Motor Vehicle Insurance Act" lowers the minimum amount that insurance companies typically must insure motorists for under state law in auto accidents. Hyped as greater "choice" for consumers in the bill's title, the law can mean lower payouts for insurance companies, yielding higher profits. The lower minimum coverage can also mean that consumers who thought they had insurance for serious accidents do not have enough to cover the injured parties. In Wisconsin, for example, Governor Scott Walker signed legislation within weeks of taking office in 2011 that reduced the state's minimum coverage for auto liability insurance by half. ALEC has also promoted a model bill for secondary car parts -- the After Market Crash Parts Act -- again leading to lower costs for insurers that pay to fix their insured's vehicles, and transfer the risk to policy holders that after-market replacement parts might be inferior to the manufacturer's part. As of April 15, at least 10 consumer-oriented U.S. corporations have severed ties with ALEC, including several companies joining State Farm on the Fortune 500 list, such as Kraft, Coca Cola, and McDonald's. *This article was modified on 4/19/2012 to clarify that the second bullet refers to uninsured persons. 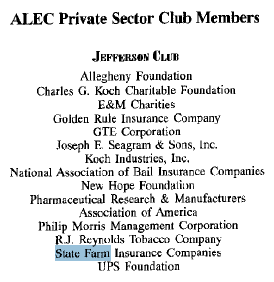 The image showing State Farm as a major ALEC donor alonside Koch Industries and others from 1998 was added on 4/23/12. I have already told State Farm I will not renew my insurance in 6 months is they are still in ALEC. Unfortunately, I had just paid my premiums when this came up. Losing customers is the only thing the company will understand. To those who have re-newed the premiums--don't fret, you can cancel and get a full refund and just sign up with another company. I just wrote a letter to my local state farm agent with whom I have worked for 25 years. I told her my concerns and let her know that I plan to move to another company and asked her to inform the higher ups. I hope everyone does the same. I am researching companies as this is written. Can you imagine if we boycott every company there is out there for supporting certain groups. we would do nothing but destroy our economy in already troubling financial times. Stop diving the american people Zimmerman made bad call and i'm sure he will regret for the rest of his. No, we will not destroy the economy because another insurance company will be getting our business. I haven't purchased a Johnsonville product for over a year now but I'm still buying brats. That's how the free market works. If a product is bad we don't buy it. If a company is supporting legislation that I find immoral they won't get my business. Today I found an insurance company that isn't an ALEC member and I'm canceling my State Farm policies and switching. I am planning to leave State Farm, too. I was recently involved in an accident with a person insured by Erie Insurance. (I live in the central Atlantic area) and I was most impressed by the way they handled the repairs on my car. I am going to investigate them first, just to be sure they aren't a member of Alec, but if they aren't, I'm going to switch to them. I will be canceling auto insurance with State Farm at the end of this week and will be using AAA, a not for profit customer service oriented provider rather than a shareholder/ALEC driven corporation. I have been a State Farm customer for many years, but knowing of their affiliation with ALEC I have been wanting to change to a different carrier - but who? Thanks for the tip about AAA - I will call them today and then I will call my State Farm agent and tell her why I am changing. Again, thanks so much for the tip on AAA. I have done the same thing via email to my agent, and posted my letter on my FB page for political action in our state.